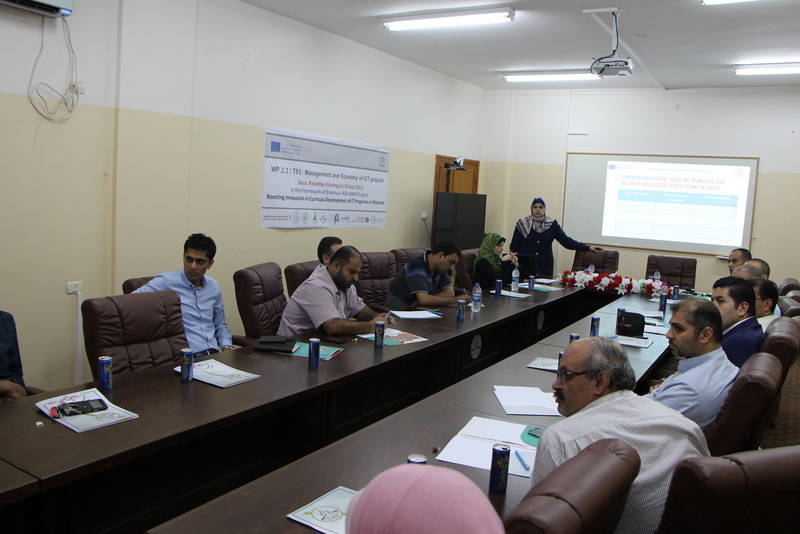 University College of Applied Sciences (UCAS) in cooperation with Gaza University conducted four days training program during the period of 19-27 September 2017, the first part of the training track (BITPAL-WP.2.2 on TS2: Management and economy of ICT projects). This training aimed to develop competences and skills that cover the important topics that are highlighted in the outcomes of the project first training mission in German, which are mainly related to Management and economy of ICT projects implemented in Leipzig- Germany in order to directly impact on the target workforce competence building and knowledge. The training was a multidisciplinary one that covers the core specialization topics in addition to a filed visit to two incubators in Gaza (UCASTI and PICTI). The third session was conducted in Gaza University introduced the Ministry of Economy aspects and strategy in providing licenses and accreditation to young enterprises. Mr Yaqoub Algandoor, Representative of Ministry of National Economy talked about "Steps to be Taken to Incorporate a New Company" to help creating an added value to the expected incubation model within BITPAL project.